November 7, 1987: The Samoans (Samu & Fatu) defeated Invader 1 & 3 in a Tournament Final to win the Caribbean Tag Titles! Fatu started off in the World Class territory in Dallas, Texas, where he teamed with his cousin, Samu as the Samoan Swat Team..
August 12, 1988: The Samoan Swat Team defeated Kerry & Kevin Von Erich to capture the World Class Tag Team titles! September 16, 1988: Michael Hayes & Steve Cox defeated The SST for the World Class Tag Team titles..
September 19, 1988: The SST defeated Michael Hayes & Steve Cox to recapture the WCCW Tag Team titles..
October 15, 1988 – Cotton Bowl Extravaganza: Michael Hayes & Steve Cox defeated The SST again to win the Tag Team titles..
October 17, 1988: The SST defeated Michael Hayes & Steve Cox to win their 3rd World Class Tag Team titles! December 13, 1988 – SuperClash III: The Samoan Swat Team defeated Michael Hayes & Steve Cox to retain the Tag Team Titles. 1989: The SST (Samoan Swat Team) moved to the NWA, where they were managed by Paul E. Dangerously..
~~~Soon after, Oliver Humperdink took over as their manager..
April 2, 1989 – Clash of the Champions VI: Samoan Swat Team defeated The Midnight Express..
May 7, 1989 – WrestleWar: Dynamic Dudes (Shane Douglas & Johnny Ace) defeated The Samoan Swat Team..
June 14, 1989 – Clash of the Champions VII: The Midnight Express defeated The SST in the 1st round of a 4-Team Tournament..
July 23, 1989 – Great American Bash: Road Warriors/Midnight Express/Steve Williams beat Freebirds & The SST in WarGames..
September 12, 1989 – Clash of the Champions VIII: The Road Warriors defeated The Samoan Swat Team.. The Samoan Swat Team added a third member to the team — Tama, The Samoan Savage..
October 28, 1989 – Helloween Havoc: The Samoan Swat Team & Samoan Savage beat The Midnight Express & Steve Williams..
December 13, 1989 – Starrcade: The Samoan Savage & Fatu defeated Doom in the 1st Round of the Iron Team Tournament..
May 19, 1990 – Capital Combat: Fatu & Samoan Savage defeated Mike Rotunda & Tommy Rich..
June 13, 1990 – Clash of the Champions XI: Tom Zenk & Mike Rotunda defeated Samoan Savage & Fatu..
1992: The Headshrinkers (Fatu & Samu-formerly the SST) debuted in the WWF managed by Afa..
October 26, 1992 – Survivor Series Showdown: The Headshrinkers (Fatu & Samu) defeated Red Fox & Royce Royal. November 7, 1992 – Superstars: The Headshrinkers (Fatu & Samu) defeated Brian Costello & Joey Maggs. November 8, 1992 – Wrestling Challenge: The Headshrinkers (Fatu & Samu) defeated Bill Jordan & Brian Jewel. November 14, 1992 – Superstars: The Headshrinkers (Fatu & Samu) defeated Bob St. Laurent & Jim Powers. November 28, 1992 – Superstars: The Headshrinkers (Fatu & Samu) defeated George Anderson & Kevin Krueger. December 6, 1992 – Wrestling Challenge: The Headshrinkers (Fatu & Samu) defeated Dan Robbins & John Larz. December 20, 1992 – Wrestling Challenge: The Headshrinkers (Fatu & Samu) defeated Dave Morgan & Matt Williams. December 26, 1992 – Superstars: The Headshrinkers (Fatu & Samu) defeated Bill Vaper & Chris Allen. January 10, 1993 – Wrestling Challenge: The Headshrinkers (Fatu & Samu) defeated Carl Almont & Scott Colton. January 24, 1993 – Royal Rumble: Fatu entered the Royal Rumble at #22 but was eliminated by Bob Backlund.. Samu was also in the Royal Rumble match. January 30, 1993 – Superstars: The Headshrinkers (Fatu & Samu) defeated Bobby Perez & Reno Riggins. February 7, 1993 – Wrestling Challenge: The Headshrinkers (Fatu & Samu) defeated Gary Jackson & Jim Brunzell. February 13, 1993 – Superstars: The Headshrinkers (Fatu & Samu) defeated Kelly New & Robert Thompson in dark match. February 28, 1993 – Wrestling Challenge: The Headshrinkers (Fatu & Samu) defeated Alan Reid & Scott Bazo. March 6, 1993 – Superstars: The Headshrinkers (Fatu & Samu) defeated Dave Starr & Gary Key. 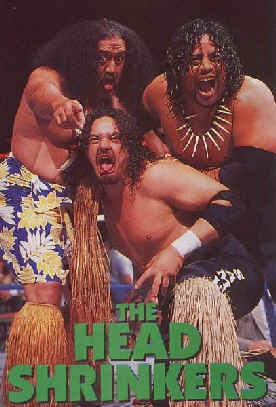 March 21, 1993 – Wrestling Challenge: The Headshrinkers (Fatu & Samu) defeated Jesse Storm & Mark Ming. April 4, 1993 – WrestleMania IX: The Steiner Brothers defeated The Headshrinkers..
April 4, 1993 – Wrestling Challenge: The Headshrinkers (Fatu & Samu) defeated Jim Powers & Les Parker. April 17, 1993 – Superstars: The Headshrinkers (Fatu & Samu) defeated JD Stryker & Ron Preston. April 25, 1993 – Wrestling Challenge: The Headshrinkers (Fatu & Samu) defeated Jim Armstrong & Shawn Dakota. April 26, 1993 – RAW: The Headshrinkers (Fatu & Samu) defeated Jay Sledge & Jim Bell. May 1, 1993 – Superstars: The Headshrinkers (Fatu & Samu) defeated Bob Young & Scott Bazo. May 30, 1993 – Wrestling Challenge: The Headshrinkers (Fatu & Samu) defeated Jay Sledge & Russ Greenberg. June 5, 1993 – Superstars: The Headshrinkers (Fatu & Samu) defeated Scott Taylor & Tim McNeany. June 13, 1993 – King of the Ring: The Smoking Gunns (Bart Gunn & Billy Gunn) & The Steiner Brothers (Rick Steiner & Scott Steiner) defeated Money Inc. (Irwin R. Schyster & Ted DiBiase) & The Headshrinkers (Fatu & Samu). June 20, 1993 – Wrestling Challenge: The Headshrinkers (Fatu & Samu) defeated Ralph Mosca & Scott Despres. June 26, 1993 – Superstars: The Headshrinkers (Fatu & Samu) defeated Buddy Lenny & Mike Davis. July 5, 1993 – RAW: The Headshrinkers (Fatu & Samu) defeated LA Gore & Russ Greenberg in a dark match. July 11, 1993 – Wrestling Challenge: Bam Bam Bigelow & The Headshrinkers (Fatu & Samu) defeat Tatanka & The Smoking Gunns (Bart Gunn & Billy Gunn). July 12, 1993 – RAW: The Headshrinkers (Fatu & Samu) defeated Aaron Ferguson & PJ Walker. July 31, 1993 – Superstars: The Headshrinkers (Fatu & Samu) defeated Bret Tyler & Dave Thornberg. August 16, 193 – Superstars: The Headshrinkers (Fatu & Samu) defeated Dave Maraldo & Mike Khoury. August 30, 1993 – SummerSlam: Tatanka & The Smoking Gunns (Bart Gunn & Billy Gunn) defeated Bam Bam Bigelow & The Headshrinkers (Fatu & Samu). September 11, 1993 – Superstars: The Headshrinkers (Fatu & Samu) defeated Marty Jannetty & Virgil. September 19, 1993 – Wrestling Challenge: The Headshrinkers (Fatu & Samu) defeated Mike Davis & Tony Roy. October 3, 1993 – Wrestling Challenge: The Headshrinkers (Fatu & Samu) defeated Red Tyler & Virgil. October 9, 1993 – Superstars: The Headshrinkers (Fatu & Samu) defeated Steve Nixon & Tony Bithera. October 11, 1993 – RAW: The Headshrinkers (Fatu & Samu) defeated Sid Curtis & Tommy Morrison. October 31, 1993 – Wrestling Challenge: The Headshrinkers (Fatu & Samu) defeated Barry Horowitz & Ralph Mosca. November 6, 1993 – Superstars: The Headshrinkers (Fatu & Samu) defeated ??? & Greg Hatfield. November 8, 1993 – RAW: The Headshrinkers (Fatu & Samu) defeated Mike Bucci & Mike Maraldo. November 24, 1993 – Survivor Series: Men On A Mission (Mabel & Mo) & The Bushwhackers (Butch & Luke) defeated Bam Bam Bigelow, Bastion Booger & The Headshrinkers (Fatu & Samu) in a tag team elimination match. December 4, 1993 – Superstars: The Headshrinkers (Fatu & Samu) defeated Greg Hatfield & Todd Mata. December 20, 1993 – RAW: The Headshrinkers (Fatu & Samu) defeated Jerry Seavey & Phil Apollo. January 1, 1994 – Superstars: The Headshrinkers (Fatu & Samu) defeated Mike Khoury & Tim McNeany. January 2, 1994 – Wrestling Challenge: Headshrinkers (Fatu & Samu) defeated John Chrystal & Russ Greenberg. January 9, 1994 – Wrestling Challenge: The Headshrinkers (Fatu & Samu) defeated Dan Dubiel & Phil Apollo. January 15, 1994 – Superstars: The Headshrinkers (Fatu & Samu) defeated JS Storm & Tony DeVito. January 22, 1994 – Royal Rumble: Fatu & Samu interfered in the Undertaker vs. Yokozuna Casket Match helping Yokozuna. The Headshrinkers were also in the Royal Rumble match won by Bret Hart. January 24, 1994 – RAW: The Headshrinkers (Fatu & Samu) defeated Men On A Mission (Mabel & Mo). January 29, 1994 – Superstars: The Headshrinkers (Fatu & Samu) defeated Larry McGill & Sid Garrison. March 6, 1994 – Wrestling Challenge: The Headshrinkers (Fatu & Samu) defeated Scott Taylor & Tony Roy. April 4, 1994 – RAW: Irwin R. Schyster, Jeff Jarrett, Rick Martel & The Headshrinkers (Fatu & Samu) defeated Tatanka, The 1-2-3 Kid, The Smoking Gunns (Bart Gunn & Billy Gunn) & Thurman Sparky Plugg. April 9, 1994 – Superstars: The Headshrinkers (Fatu & Samu) defeated Emilio Ulacia & Phil Apollo. April 24, 1994 – Wrestling Challenge: The Headshrinkers (Fatu & Samu) defeated Derek Domino & Tyrone Knox. After the heel run was over, Capt. Lou Albano joined the group and the Headshrinkers turned face..
April 26, 1994 – RAW: The Headshrinkers defeated The Quebecers to win the world tag team titles..
May 21, 1994 – Superstars: The Headshrinkers (Fatu & Samu) defeated Jim Messenger & Ray Roy to retain the world tag team titles. June 5, 1994 – Wrestling Challenge: World tag team champions The Headshrinkers (Fatu & Samu) defeated Mike Maraldo & Tony DeVito in a non-title match. June 19, 1994 – King of the Ring: The Headshrinkers (Fatu & Samu) defeated Yokozuna & Crush to retain the Tag Team Titles..
June 27, 1994 – RAW: The Headshrinkers (Fatu & Samu) defeated The Executioners (Executioner #1 & Executioner #2) to retain the world tag titles. July 16, 1994 – Superstars: The Headshrinkers (Fatu & Samu) defeated Mike Bell & Nick Barberi to retain the world tag team titles. July 17, 1994 – Wrestling Challenge: World tag team champions The Headshrinkers (Fatu & Samu) defeated Well Dunn (Steven Dunn & Timothy Well) in a non-title match. July 25, 1994 – RAW: World tag team champions The Headshrinkers (Fatu & Samu) defeated Barry Hardy & Joey Stallings in a non-title match. August 13, 1994 – Superstars: The Headshrinkers (Fatu & Samu) defeated Barry Horowitz & Reno Riggins to retain the world tag team titles. August 21, 1994 – Wrestling Challenge: World tag team champions The Headshrinkers (Fatu & Samu) defeated Mark Thomas & Scott Taylor in a non-title match. Afa often joined the Headshrinkers in six man tag matches against The Quebecers and their manager Johnny Polo in house shows..
August 28, 1994 – Live Event: Diesel & Shawn Michaels defeated The Headshrinkers (Fatu & Samu) to win the world tag team titles. August 29, 1994 – SummerSlam: Bam Bam Bigelow & IRS defeated The Headshrinkers by disqualification when Afa attacked Bam Bam Bigelow..
September 4, 1994 – Wrestling Challenge: The Headshrinkers (Fatu & Samu) defeated Bill Mata & Nick Barberry. September 10, 1994 – Superstars: The Headshrinkers (Fatu & Samu) defeated Mike Bell & Tony DeVito. September 25, 1994 – Wrestling Challenge: The Headshrinkers (Fatu & Samu) defeated Rock Warner & Tom Stone. October 8, 1994 – Superstars: The Headshrinkers (Fatu & Samu) defeated Barry Horowitz & Ron Higgins. Samu left the WWF (due to rumored health problems), and is replaced by Sionne (who was known world wide as the Barbarian)..